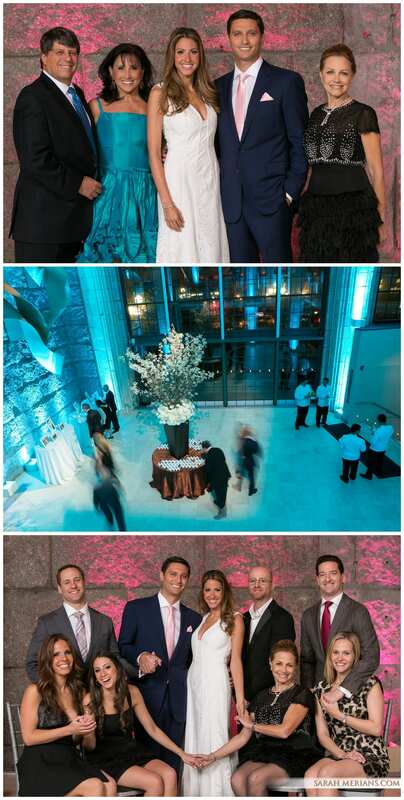 On this Wedding Wednesday, check out these special moments in our Year in Review: Weddings for 2015! 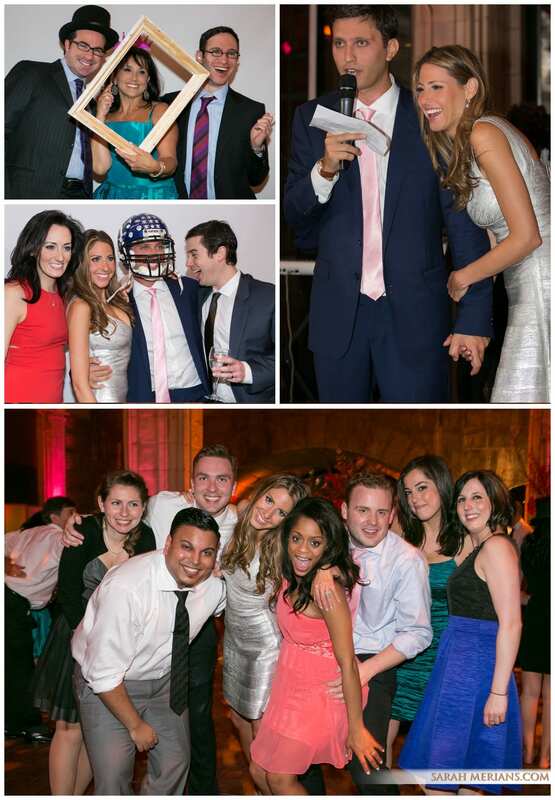 We loved being a part of celebrating life at its best with these brides and grooms! Happy Holidays to all! 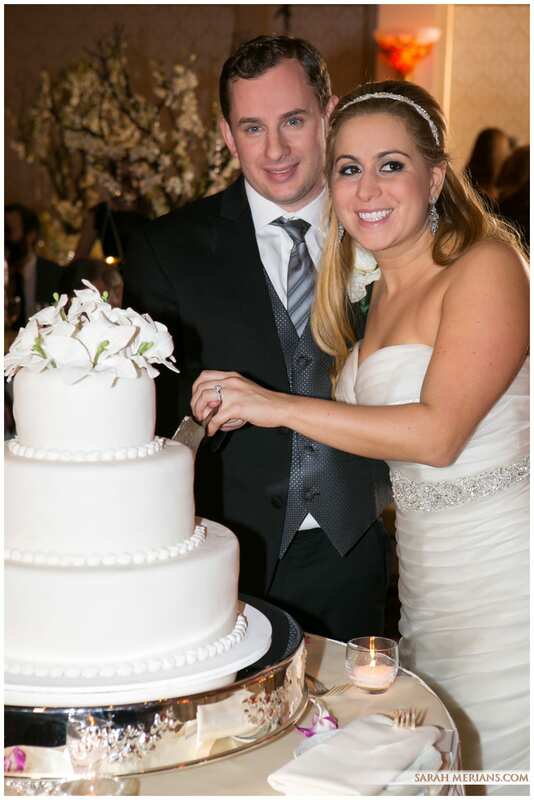 This happy couple tied the knot on a beautiful fall day in New Jersey at Temple Emanu-El. The Temple, known for its gorgeous stained glass dome, set the stage for the wedding. Family, friends, bridesmaids in purple and groomsmen with blue ties gathered as Elana and Michael stood under the chuppah and became husband and wife. Cocktails were served outside on the patio and guests got to greet the happy couple in the ballroom as they danced their first dance as a married couple. 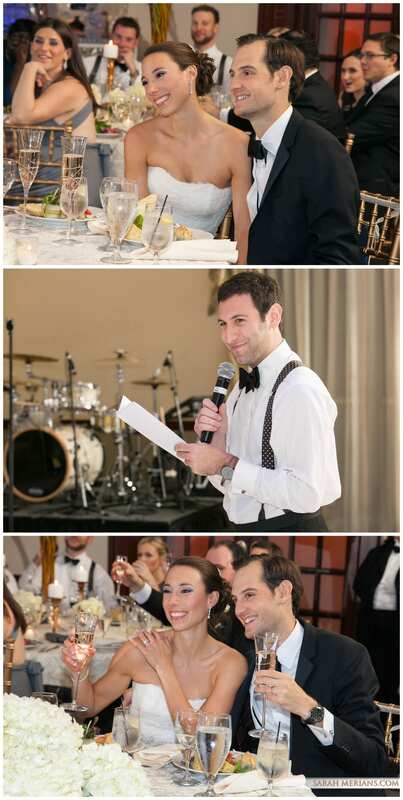 New York Edge Orchestra provided all the music for the wedding celebration. 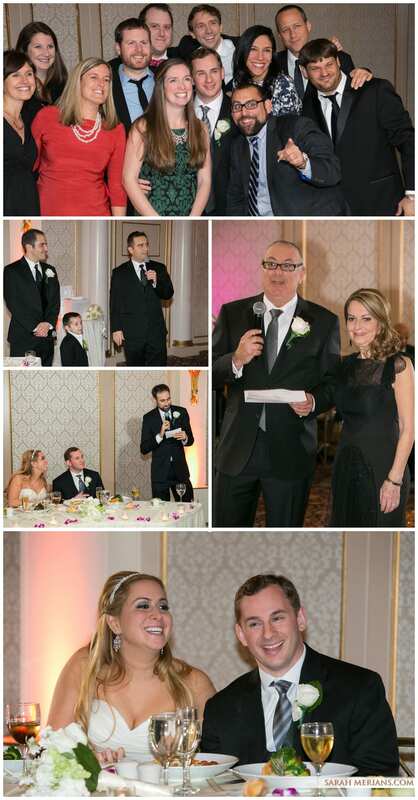 There is nothing better than being a part of a wedding for a family we love. 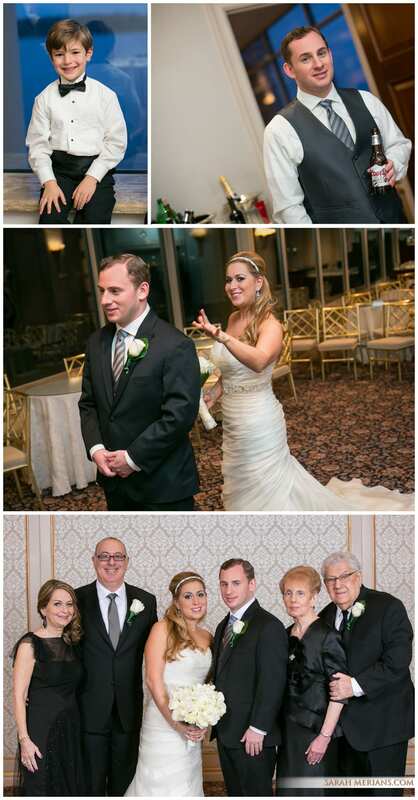 We photographed Tracey’s brother and step-sister’s weddings back in 2012 and 2013 and now it was Tracey’s turn! 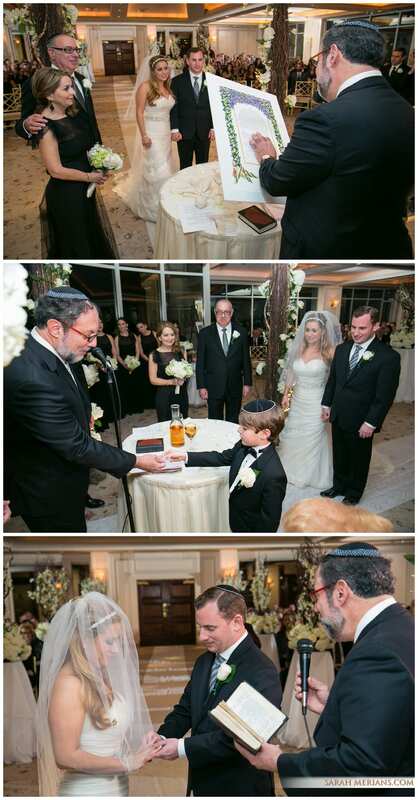 Temple Emanu-El of Closter set the stage for this happy couple’s nuptials. We loved bride Tracey’s strapless lace mermaid style gown with a winter white fur shawl to match. And we got to see groom David cutting loose and singing on the dance floor! Congratulations Tracey and David! We love you guys! 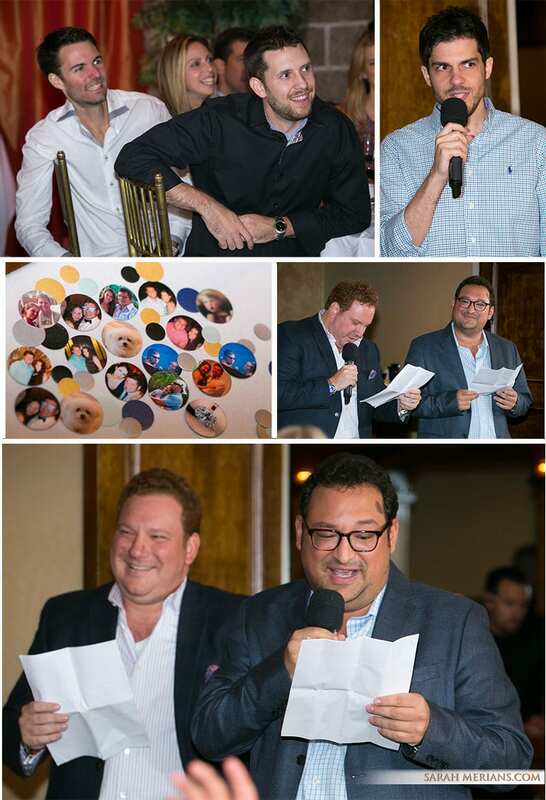 We can’t believe 18 years have passed since we photographed Steven’s Bar Mitzvah ! 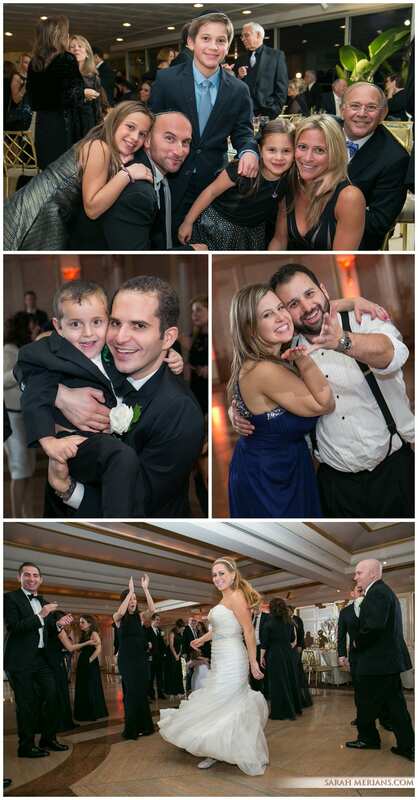 We were SO happy we could celebrate another amazing milestone with Steven and his family at his wedding to Amanda earlier this year at Guastavino’s! 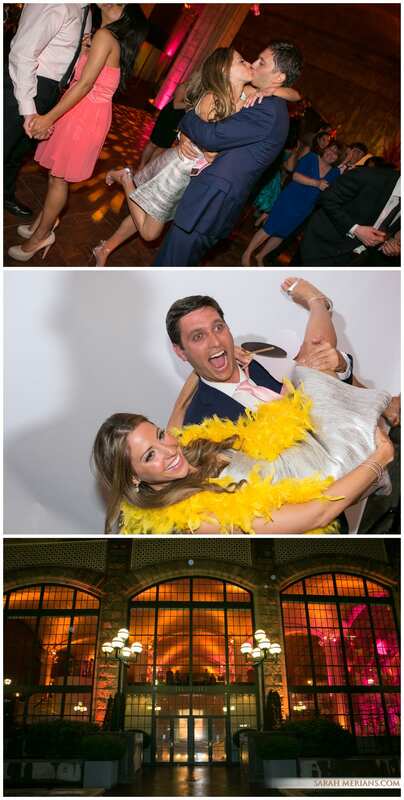 Although the happy couple tied the knot in South Africa earlier this year, they held another small ceremony followed by a party, NY style, at the beautiful Guastavino’s. 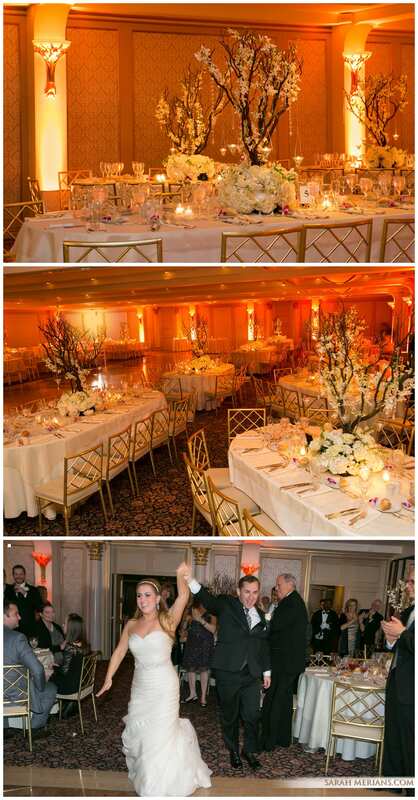 The venue’s high ceilings and large windows paired nicely with the custom colored room lighting. The bride & groom opted for a cupcake tree instead of a tiered wedding cake and guests had a blast in our photo booth, with custom University of Michigan props provided by mother of the groom, and our friend, Margie. Go Michigan go! 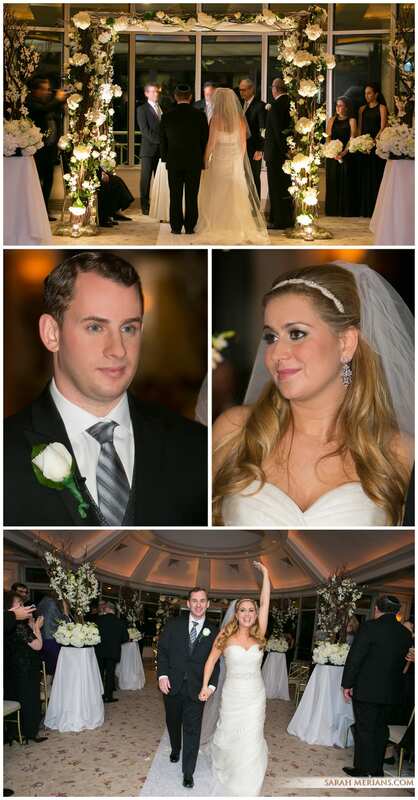 Bride Brooke always dreamed of a winter wedding. 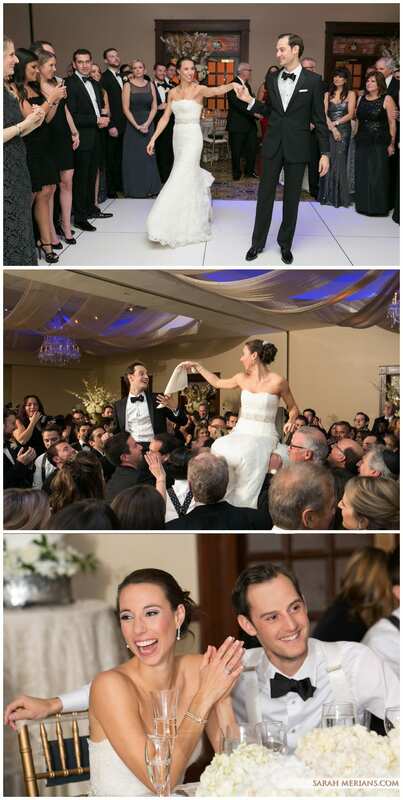 She tied the knot with the love of her life, Michael, at an early January wedding at Westchester Reform Temple in Scarsdale. Our photographer, Sarah Merians, was on hand to capture all the best moments of the day from the bride and groom’s first look to family photos, those first snowflakes and the special moment where Brooke and Michael exchanged rings and said “I Do.” Merians was even able to carve the couple’s initials into the snow! For this special occasion, Brooke chose to honor the generations before her, opting to wear her grandmother’s sister’s wedding dress -with a few tweaks, of course. Brooke was the fifth one to wear the dress, which was passed down to her grandma, mother and aunt before she took those steps down the aisle. The 70-year-old dress was in amazing condition, but Brooke removed the Cathedral- length train so it would be easier for her to walk and dance in. She actually turned the dress around so the buttons were in the front for a different and unique look . She made the dress her own. Westchester Reform Temple is also a cherished landmark in Brooke’s family history. Brooke grew up going to the Temple and every major milestone event from her Bat Mitzvah to confirmation was held at the Temple. “It was nice to have the wedding in a place that was familiar and meaningful to my family,” she adds. And when it comes to showcasing her love for her husband at her wedding, Brooke knew just how to do it. 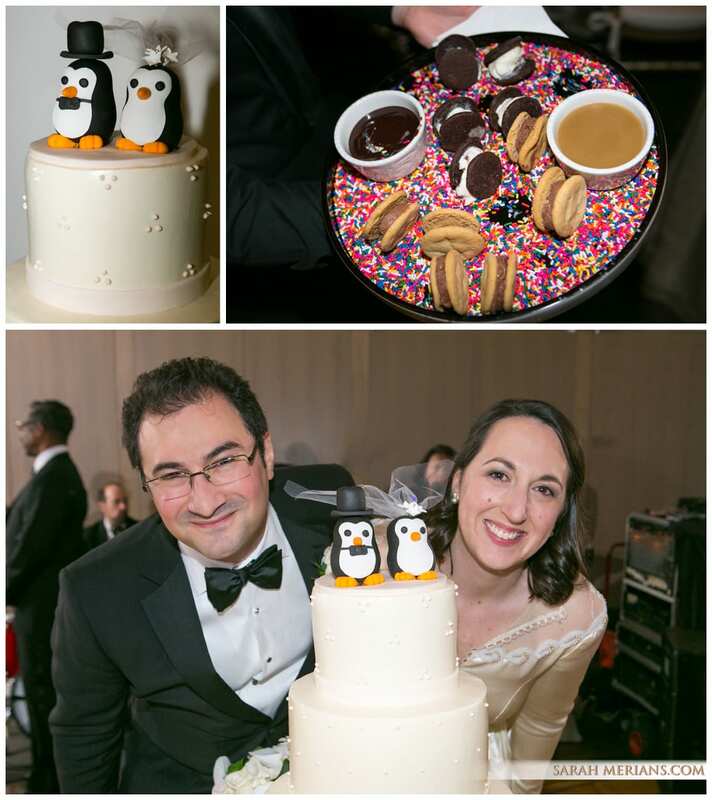 She chose an adorable bride and groom penguin topper to adorn their wedding cake. But, in addition to being a great representation of winter and looking spiffy in their wedding gear, the penguins meant so much more. “[Penguins] find their mate and stick with them for life,” states Brooke. 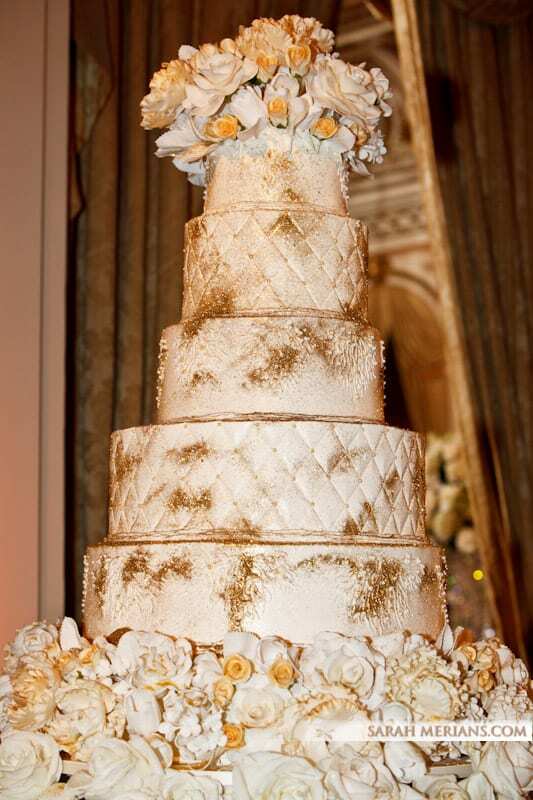 Tradition and unique wedding details are so important to Sarah. We wanted to share the passion and power of tradition with our potential future brides. 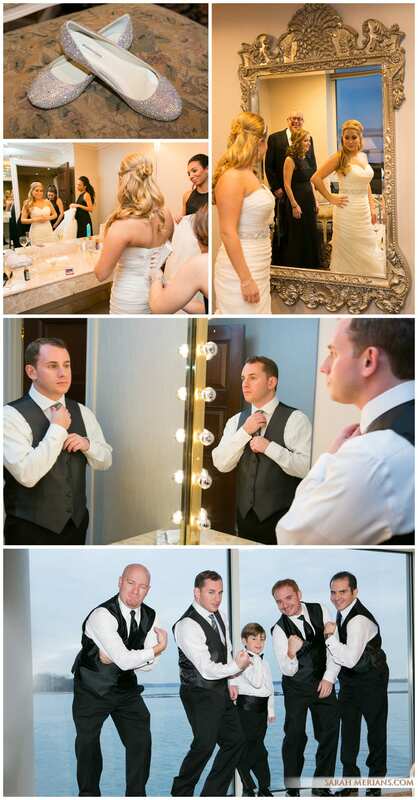 Take a look at a collection of photos from Brooke and Michael’s wedding day below. 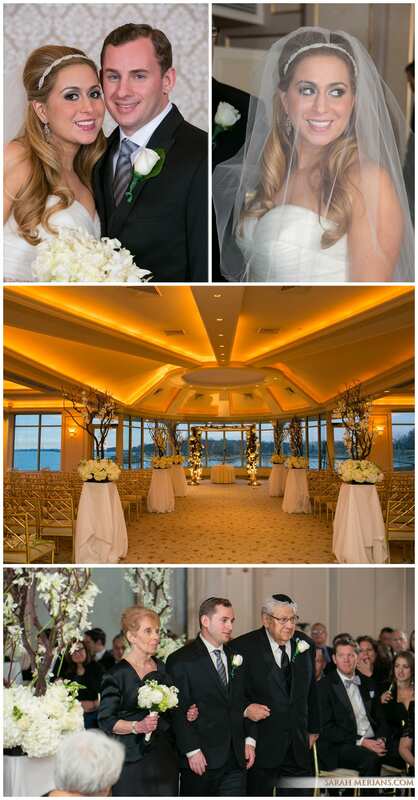 Rachel and Jay tied the knot at an indoor waterfront ceremony at Glen Island Harbour Club. 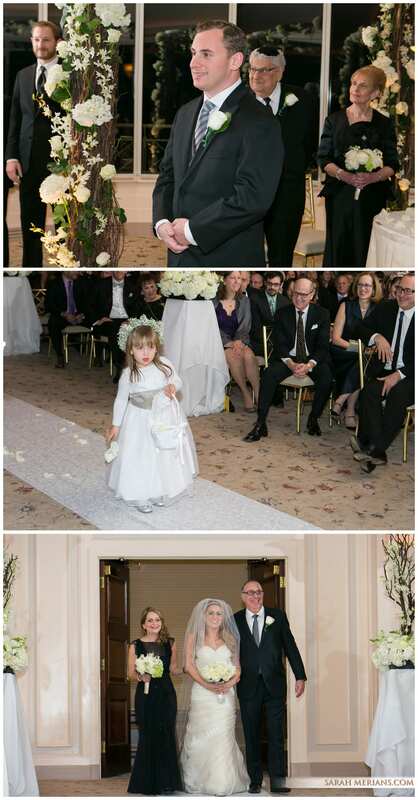 Rachel’s nieces and nephews played the roles of flower girl & ring bearers as the happy couple recited their vows in the company of family and friends. Rachel looked beautiful in her strapless organza gown, headband and veil. And we loved her sparkly flats, suited perfectly for dancing! It was a night to remember. Congratulations, Rachel and Jay! 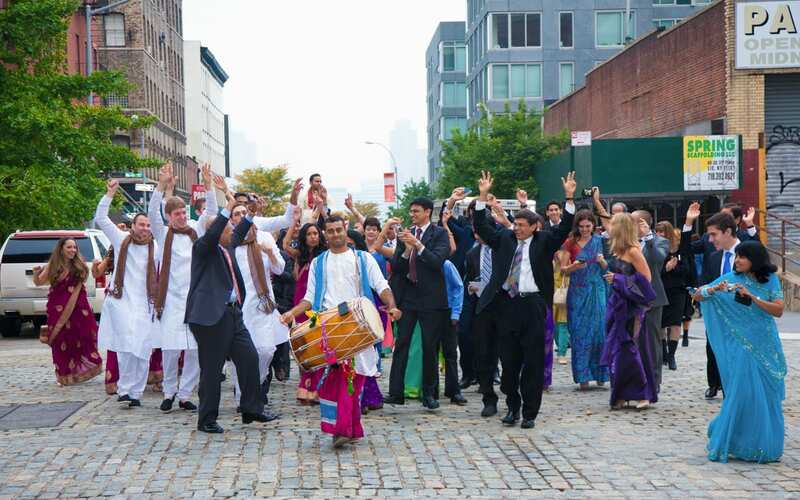 There are many rituals that are common among nationalities, religions and cultures that are celebrated at a wedding ceremony. 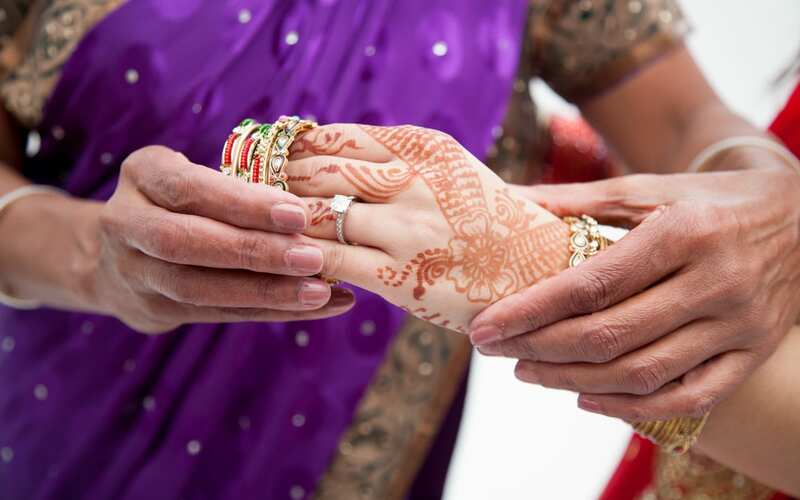 The marriage creates meaning; fusing both a bride and groom’s family histories and cultures into one. The wedding is the perfect opportunity to highlight these traditional elements that make up each family’s identity. 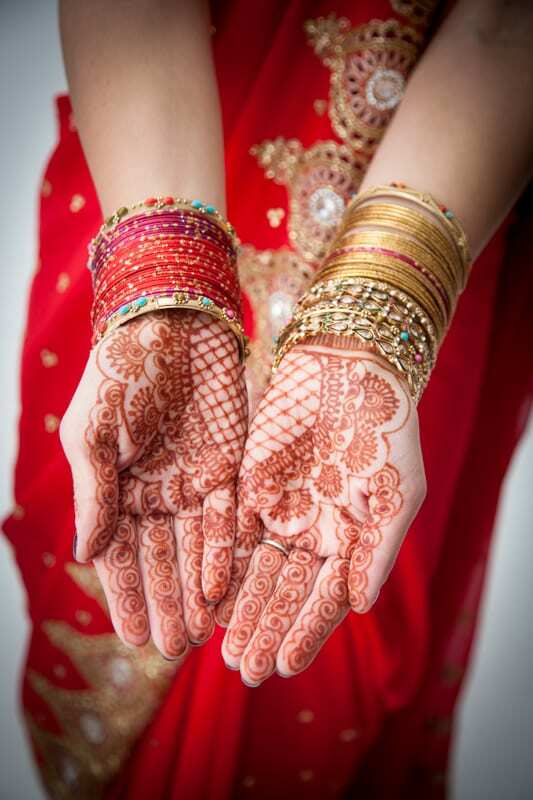 In the Hindu tradition, a Mehndi artist applies henna to the hands and feet of the bride and other female family members the night before the wedding. 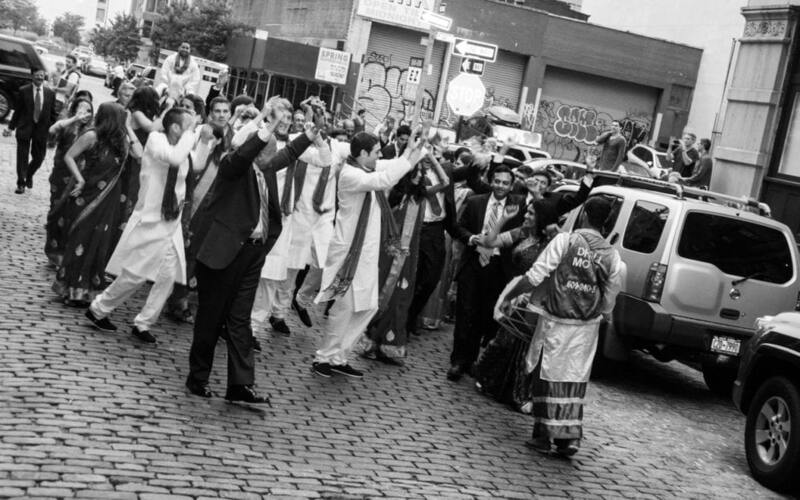 Another intricate part of the Indian wedding is the Baraat- the groom’s procession. 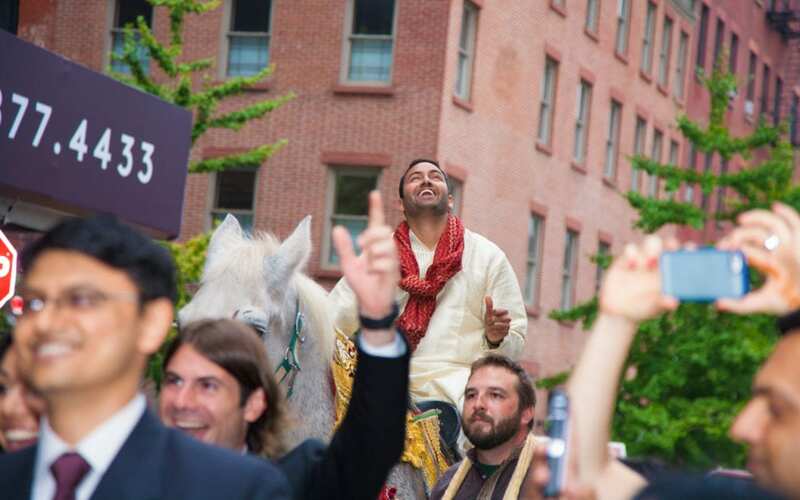 The groom-to-be travels by elephant or horse to the wedding venue entrance. 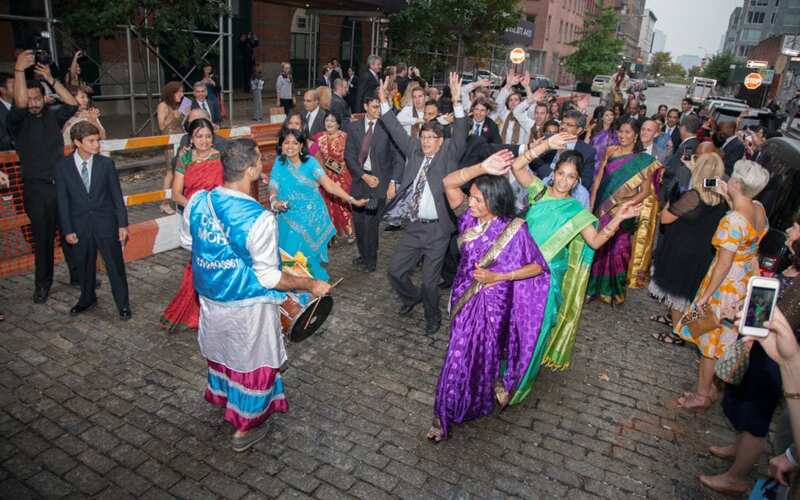 The groom’s family and friends sing and dance around him to the beat of traditional Indian bass music. 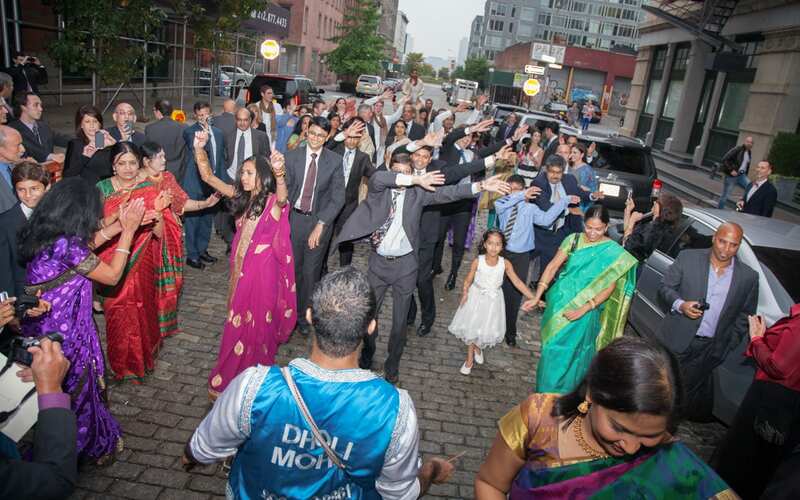 The groom and his dancing wedding guests meet the bride’s family at the entrance to the venue prior to the ceremony. 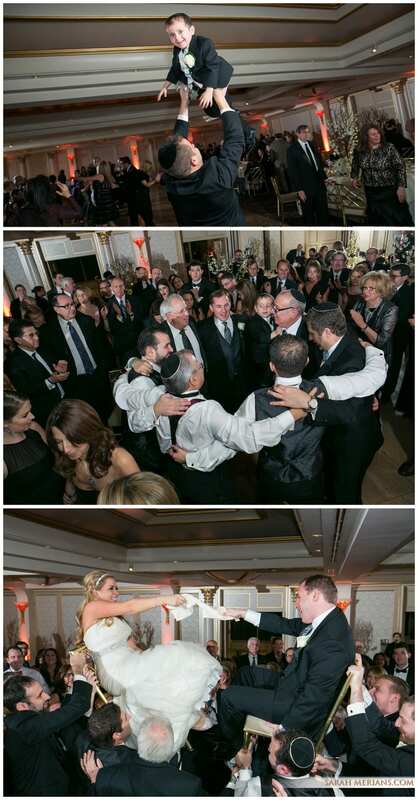 The ritual represents the groom’s family’s acceptance of the bride as part of their family. 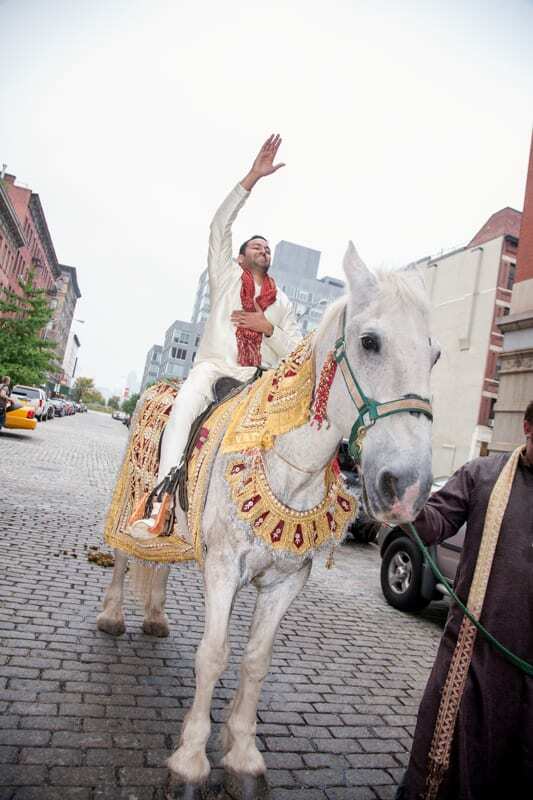 When groom Ashwin took bride Jamie’s hand in marriage, the couple happily incorporated Indian rituals like the Baraat into their downtown New York wedding, flavoring their modern Tribeca Rooftop affair with special touches of tradition. 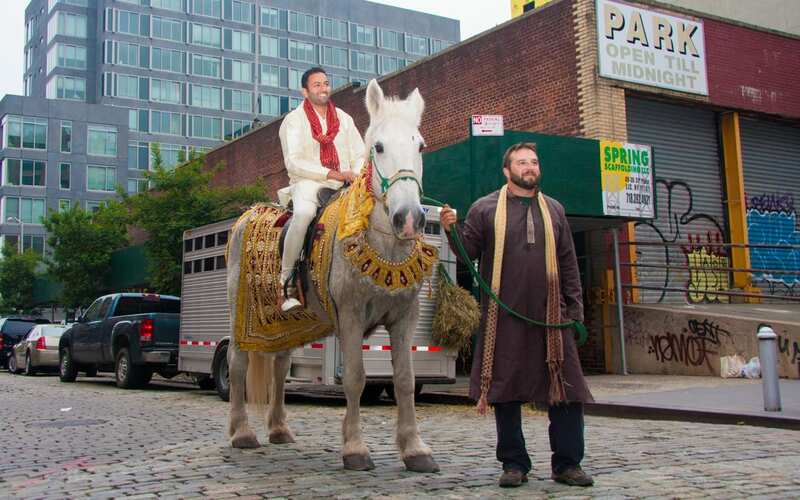 The streets of New York aren’t too kind to elephants, so this happy couple went with a horse, reinventing that classic vision of the horse and buggy days of New York City and giving it a Hindu twist. 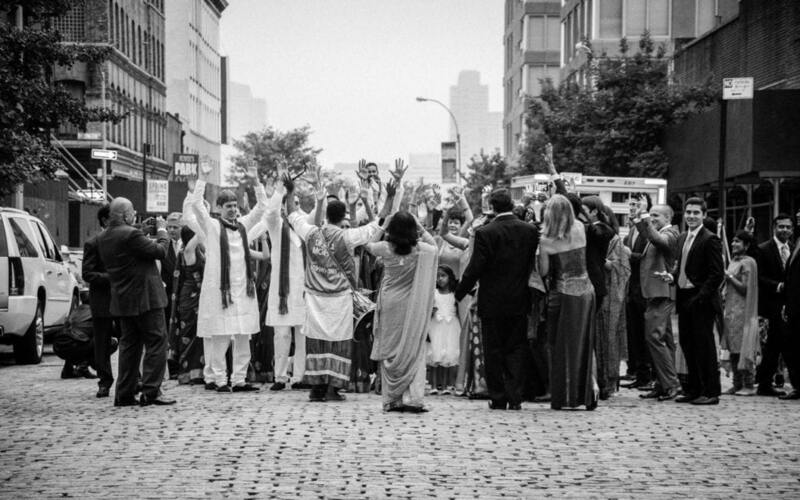 One of the things we love here at Sarah Merians Photography & Video Company are all the wonderfully unique rituals and traditions that make up our clients’ identities. Alix and Matthew’s Wedding Journey: From Engagement Shoot to Wedding! We wish all the best to Alix and Matthew, our featured couple for today’s Wedding Wednesday post. It has been so nice getting to know these two from their engagement shoot with Sarah in their Manhattan neighborhood around Lincoln Center to the pre-wedding rehearsal dinner at Gabriele’s Steakhouse in Greenwich, CT to the fabulous wedding day at The Loading Dock! These two really like to have a good time. We loved the little custom touches they incorporated into their wedding from the “photofetti” at the rehearsal dinner (an inexpensive, but personal way to decorate your event tables) to the unique green and purple orchids Alix chose for her bouquet to the modern centerpieces designed by florist Diana Gould. Faze 4 Orchestras kept the party moving on the dance floor. 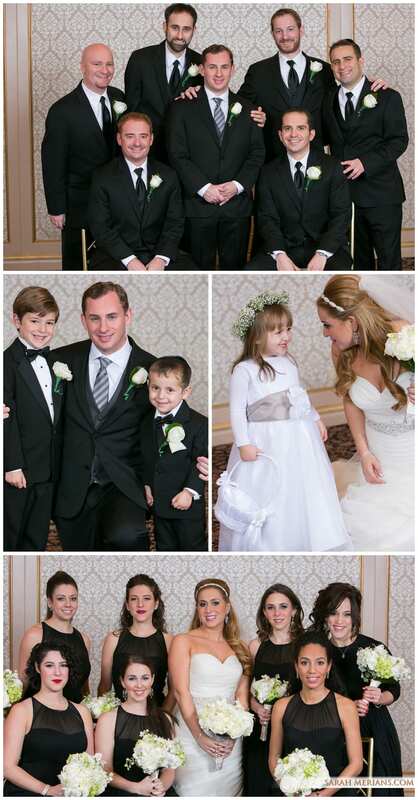 Congratulations to the bride, groom and their families! Planning to be a bridesmaid or mother of the bride in 2015? 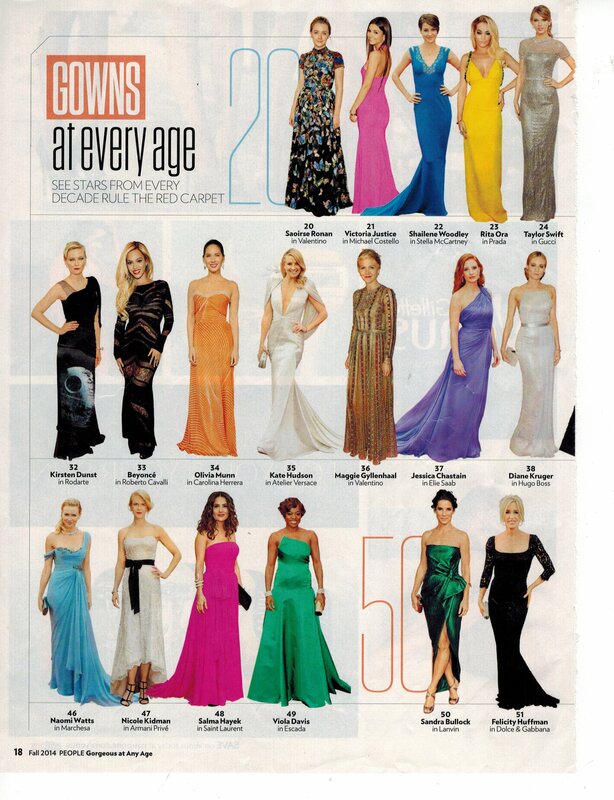 Here are some different dress styles, cuts and colors to help you make your decision on the best gown for your body!